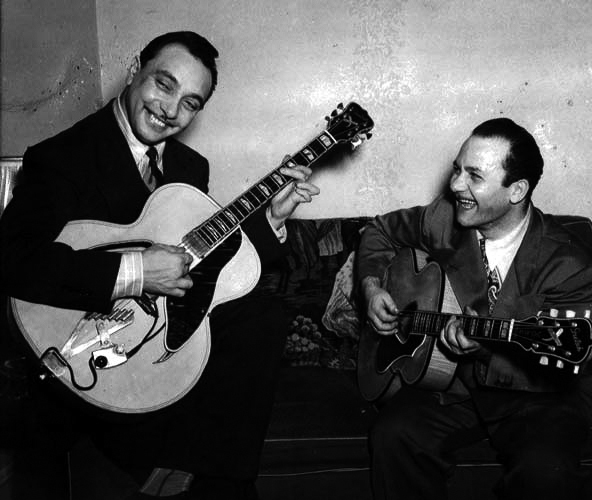 Culled from sessions that occurred in 1947 and the early 1950s, this GREAT collection contains many of Django Reinhardt’s final musical statements. 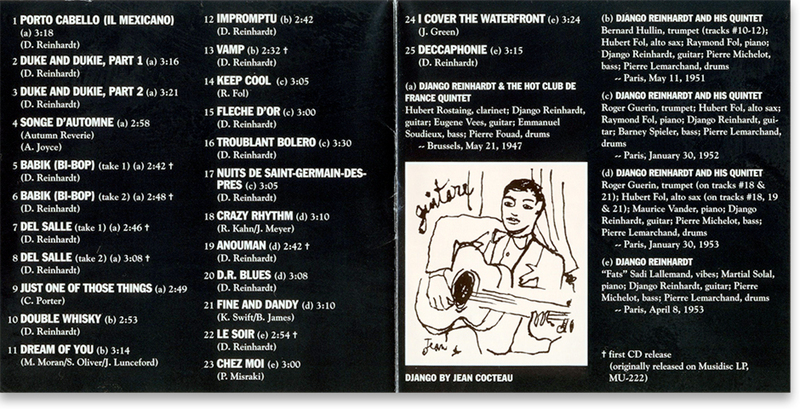 The Brussels sessions, recorded in 1947, begin the experimental/transitional arc of Django’s later career, which would continue on other sources, ie. 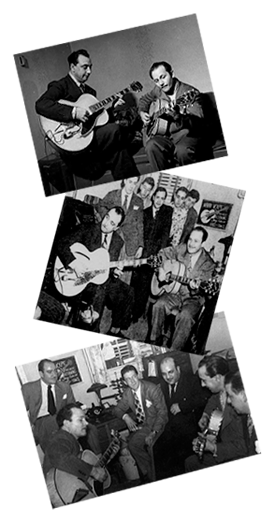 the Rome sessions from 1949-50 (I wrote about here.) The fourth electric side of “Rome” contained fun tunes like Micro, Dream of You, Place De Brouckere, Double Whiskey, and amplified versions of Minor Swing and Dinette that seem in line with the new Django, but the session(s) seem to suffer from lack of purpose, joy and a good recording environment. But back on this Hot Club of France Quintet CD (for stuff from 1950-1953) there are many (well recorded) sessions from Paris that portray a Django completely cut loose from his past. Django bounced back from severe apathy and disenchantment to record a really nice blast of music that is refreshingly original, yet very true to his earlier roots. 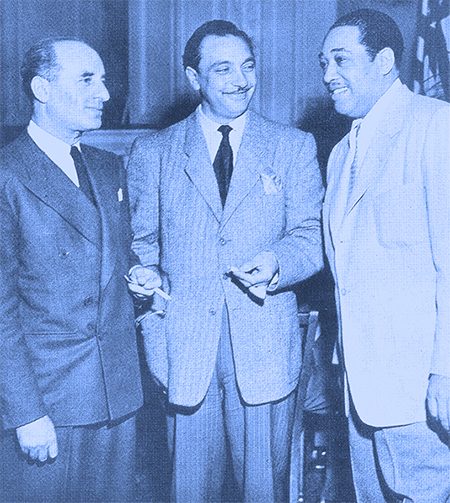 He had experienced a loss artistic stature because of the end of the Swing Era and his failure to connect with a large audience in the United States on his 1946-47 tour with Duke Ellington. His health (he lost many teeth) and financial situation, along with a temporary loss of muse, did nothing to allay his legendary apathy and dark moods. However, he gradually recovered a sense of purpose, thanks to a new music, a new way of playing guitar and willing young players eager to jam with the master. 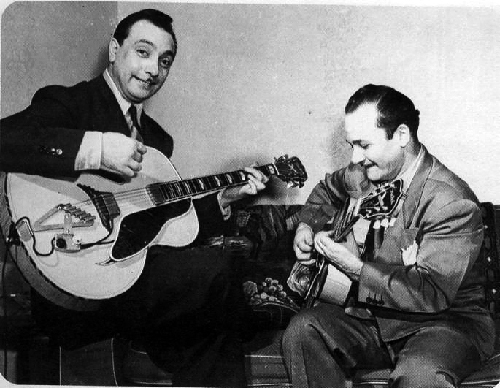 Soon after the end of World War II in 1945, Django began appearing with either an electric or amplified instrument although he still played acoustic occasionally… (On this dubbed movie clip of Nuits de Saint Germain des Prés [which is on this Hot Club of France Quintet CD] and on 3 sides of the …In Rome Sessions that he plays with Grappelli.) (You can see Django looking out the train window at the beginning of his segment that was part of the 1952 movie, La Route du Bonheur that also featured jazz legends Louis Armstrong and Sidney Bechet). 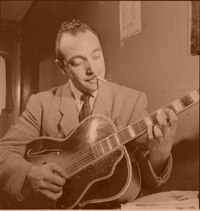 Django’s new electric sound allowed his playing to reach previously unknown heights and brought him more in line with the mainstream American jazz guitar artists of the time. 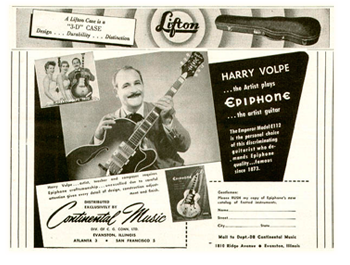 While in the States he had jammed with Les Paul, Johnny Smith and Harry Volpe (I wrote about this here) and played American guitars as multiple photographs of the time show. By all accounts Django was thrilled with the possibilities that playing an electrified instrument afforded, however he still preferred his Selmer guitar fitted now with a Stimer pickup through a Stimer amp to all of those “tinpot” American guitars as he was known to refer to them. 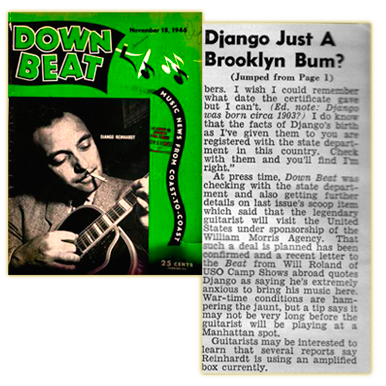 But Django did not play the Selmer exclusively. 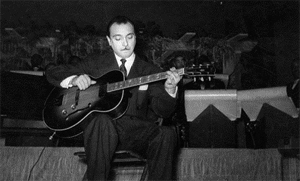 This article and these pictures from the late 40s (1948) show Django performing with a Rio Guitar at the Nice Festival. (This link leads to a really great and informative Django site!!) (Incidentally, the Nice Festival, the first international jazz festival of any renown, debuted in 1948 with Louis Armstrong and His All-Stars as the headliner with Django and Stephane Grappelli among the supporting acts.) For the first time in Django’s 15 year career his guitar carried over the band; he could vary his attack from a bluesy whisper to screaming arpeggio runs and crunchy chords, and milk the instrument for all manner of delightful new tones. On this CD I believe some of the chord stabs and comping fills (that were a bit different from all of his masterful acoustic comping) take on almost a Les Paul/Chet Atkins/Barney Kessel-type rockabilly vibe in some cases and it sounds to me that Django is completely stoked with how it sounds. Likewise, his live performances at Clubs like the Saint Germaine during this period have been hailed as some of the most enjoyable and fully realized gigs (by both band and audience) of his career. The first 9 cuts on the CD were recorded in 1947 with a band that featured one of his favorite sidemen, Hubert Rostaing, on clarinet. These tracks include “bridge” songs that show Django’s movement from the Swing Era to the 1950s: Just One of Those Things, Songe D’Automne, Del Salle, and Porto Cabello, with other more obvious nods to the destination including Duke and Dukie and Babik (Bi-Bop). All of these tunes feature Eugene Vees playing the swing style pomp guitar to varying degrees which helps make these tunes sound like they could’ve been on the Rome Sessions. Django hasn’t completely left the past behind yet. With Double Whiskey (track 10) through the end of the disc, Chez Moi, Django and his band are completely reborn; there are no pompé guitar rhythms, there IS plenty of brass (Hubert Fol, Roger Guerin and Bernard Hullin) and drums (Pierre Lemarchand) and a very mainstream (almost American) small combo sound. Through it all, of course, is a whole bunch of absolutely amazing guitar playing. Like the final take of Night and Day, Django channels every electric guitar technique and sound from the future into his final batch of recordings. Porto Cabello begins with a very haunting melody, reminiscent of Debussy perhaps, with Django playing spare figures behind. The amplified acoustic Selmer has the ability to sound semi-acoustic or semi-electric depending on Django mood. After the intro the song kicks into a key and tempo change that is completely out of the blue that features a great, very amplified solo by a Django. After a slurry, quick solo by Rostaing, the song returns to the intro tempo and fades out on that melody just as quickly as it had changed initially. It calls to mind passing boats in the harbor or a street scene even though it is subtitled “Il Mexicana”. Duke and Dukie, another Django original, is a very simple harmonic progression that allows space Django to inject cool chord stabs, octaves, and a whole flurry of single-note lines around a great rhythmic pulse. It’s a very cool early 50s vibe and there are two takes of this song on the disc. Babik (also called Bi-Bop), named for Django’s son is built off of the Dizzy Gillespie early 40s Salt Peanuts riff. Django and company take the song to new dimensions and they sound as modern and on it as Bireli Lagrene’s Gipsy Project circa 2004, the difference being that Django is playing with a drummer, Pierre Fouad. This adds a completely new dimension to the sound of a Django band and gives him a more universally recognized jazz sound. Other titles, that feature the horns of Hubert Fol, Roger Guerin and Bernard Hullin, like Double Whiskey, Crazy Rhythm, Keep Cool, and Fine and Dandy (all covers except Double Whiskey) sound very American…almost Vegas/Hollywood Movie cool. It’s a sound that Django and his Quintet wear well and I believe he was probably very happy with how these recordings came out. Not only does he sound superb as a guitarist, writer, leader, but his band is hot and plays the material well. Other tracks are total guitar standouts — Impromptu, which is Django’s hit, Dark Eyes redone as a frantic and angular bebop; Fleche D’or, a completely dizzying guitar and sax extravaganza that anticipates hard rock and fusion; the cool, laid back, Latin vibe of Troublant Bolero; and the insistent, suave, uptempo 50s sound of Nuits De Saint Germaine De Pres. On all of these tracks one can hear Django spinning his ideas out on the fly; the master improviser with new tools, a new format and a new lease on life…and art. This is also apparent on all of the blues/rhythm and blues found on the disc: I Cover the Waterfront, DR Blues, Dream of You, Vamp, Le Soir, and Deccarphonie. Django always enjoyed playing the blues and his understanding of the blues is another element that I think was expanded on his trip to the US because these blues all have an atmosphere that was lacking on his previous efforts. Deccarphonie also features superb vibes played by Martial Solal! But perhaps the best example of this was the ballad that he felt defined this whole period and who he was at this stage in his career, Anouman (A new man). He gives the very colorful and almost wistful melody (head) line to Hubert Fol and is content to solo only on the middle eight. But it is the chords fills, ghostly reverb presence of his guitar throughout the song that puts one in the mind of the story of how Django could lay by a river and listen to it for hours on end. Here at the end of his career he was no longer just showing how well a composer or improviser he was. He had transcended his station and synthesized all of his influences and life experiences into pure art and music. The one definable quality that is constant in Django’s playing that you won’t find in most modern gypsy jazz is his powerful emotionalism, subtlety and minimalist expression. 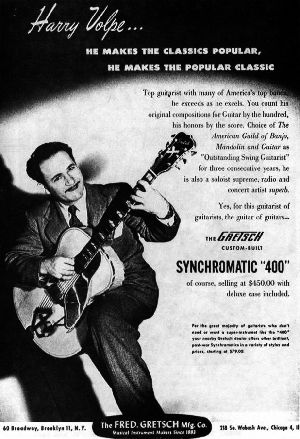 While Django could play complicated arpeggios and octagonic scale patterns at blinding speed with the best of them, he often chose to play slim, bent figures and quiet slurs to accentuate the emotional colors of his music. He also made great use of space and time to let the music breath. Even in the frenzied days of bebop, the world moved at a much slower pace than it does today and this definitely accounts for the speed and which people hear and feel. However, it is on this collection of songs, with Django’s full maturity as an accomplished player/composer realized that what he chooses not to play is what makes these cuts so interesting. This is one reason that he still reigns over the genre; his ability to impart pure feeling and emotion along with all of the verve, color and joie de vivre of Gypsy Jazz. It’s shame he left this world so soon after because it was obvious he still had plenty to say…and play!